A naming method that resolves a database service, net service name, or net service alias to a connect descriptor stored in a central directory server. The directory naming method stores connect identifiers in a centralized LDAP-compliant directory server to access a database service. A directory server provides central administration of directory naming objects, reducing the work effort associated with adding or relocating services. To manage large networking environments, administrators have to be able to easily access a centralized repository to specify and modify the network configuration. For this reason, the Oracle Net Services configuration can be stored in a LDAP-compliant directory server. The client contacts to the directory server to resolve a connect identifier to a connect descriptor. The directory server resolves the connect identifier and retrieves the connect descriptor for the client. 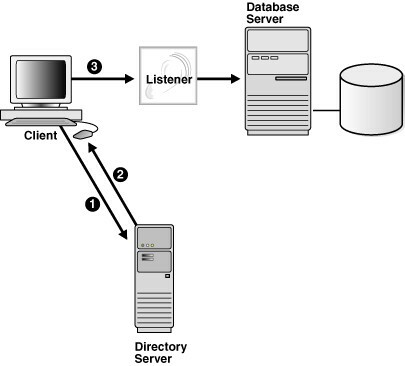 The client sends the connection request to the listener, using the connect descriptor.